How to watch The Longest Yard (2005) on Netflix Canada! Sorry, The Longest Yard is not available on Canadian Netflix, but you can unlock it right now in Canada and start watching! With a few simple steps you can change your Netflix region to a country like Spain and start watching Spanish Netflix, which includes The Longest Yard. We'll keep checking Netflix Canada for The Longest Yard, and this page will be updated with any changes. 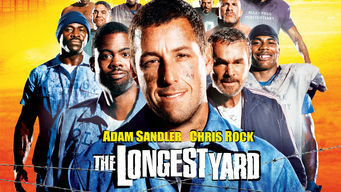 The Longest Yard is not available in Canada BUT it can be unlocked and viewed! While doing time, a professional quarterback persuades a fellow convict and former coach to prepare a group of inmates for a game against the guards. A has-been pro-baller and a motley team of convicts learn they have to bend the rules to score. It's a whole new game. There is a way to watch The Longest Yard in Canada, even though it isn't currently available on Netflix locally. What you need is a system that lets you change your Netflix country. With a few simple steps you can be watching The Longest Yard and thousands of other titles!